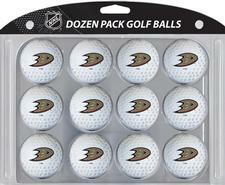 NHL One Dozen Golf Balls (All 30 Teams Available) - $22.99 - GolfersEdgeOnline.com - Best Golf Equipment On The Web! Pack includes 12 golf balls printed with your favorite team s logo. There will be no mistaking your ball on the course when you're using the Golf Balls from Team Golf. Each golf ball in this dozen pack features a team logo so you'll be able to spot your ball right away. Although it shouldn't be difficult when you're driving the ball straight down the fairway!. Golf Ball Features:. Officially licensed. If you have any more questions about the NHL One Dozen Golf Balls (All 30 Teams Available); do not see the model you are looking for; need custom options; or prefer to not purchase online, then please call us at (630) 656-1291.